The OroSecurityBundle sits on top of the Symfony security layer to reach protect your resources. This means that each user of your application is granted access to a particular subset of your company’s resources. Coincidentally, they have to be prevented from accessing resources, access was not granted to them. Access Control Lists are an essential part of the Symfony Security component. They are leveraged by the OroSecurityBundle to fulfill the requirements of companies in the business context. User BASIC_LEVEL The user is granted access to their own records. Business Unit LOCAL_LEVEL The user is given access to the records in records in all business units they are assign to. Division DEEP_LEVEL This is the same as the Business Unit level except that the user can also access all resources that are owned by subordinate units of the business units they are assigned to. Organization GLOBAL_LEVEL The user is given access to all records within the organization, regardless of the business unit the object belongs to or the user is assigned to. System SYSTEM_LEVEL The user can access all objects within the system. Each record is associated with an owning organization. 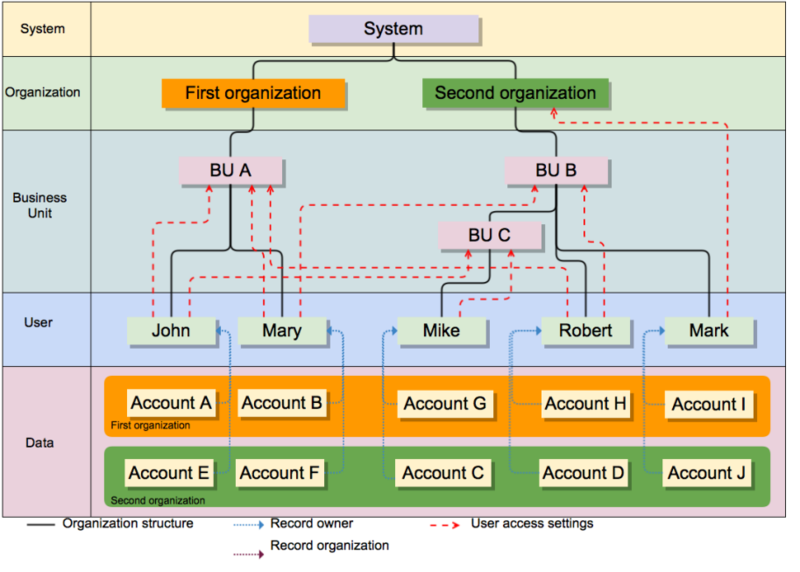 When a user logs into the system, they work in the scope of one of their organizations. 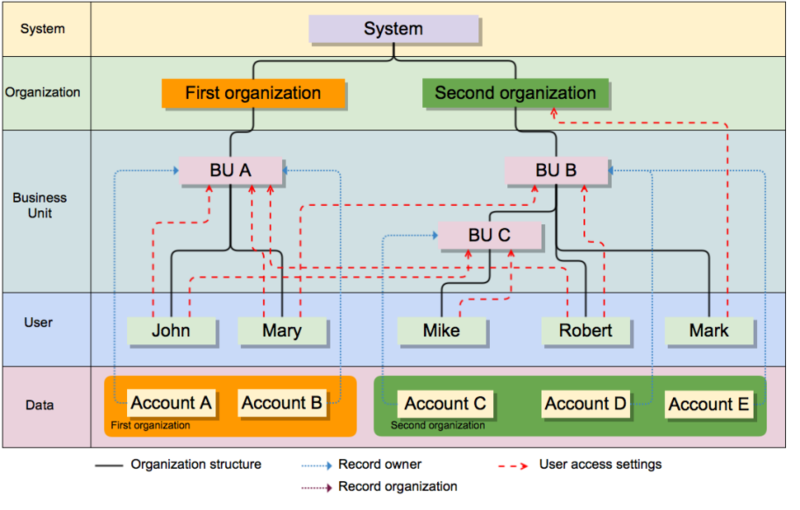 If a user is a member in several organizations, they can switch the organization scope that is used to perform access checks. For all access levels, there is a class constant defined in the AccessLevel class. Its value is shown in the Constant column. There are two special constants AccessLevel::UNKNOWN (unknown acccess level, should not be assigned to a user) and AccessLevel::NONE_LEVEL (globally deny access for the user). VIEW Whether or not a user is allowed to view a record. CREATE Whether or not a user is allowed to create a record. EDIT Whether or not a user is allowed to modify a record. DELETE Whether or not a user is allowed to delete a record. ASSIGN Whether or not a user is allowed to assign a record to another user. This permission is only evaluated when an entity is edited. Read the official documentation for a first insight in the usage of ACLs and more complex Access Control List examples. After having configured which permissions a user can be granted to a particular entity, you have to make sure that the permissions are taken into account when checking if a user has access to a resource. Depending on the resource, this check can be performed automatically by the OroSecurityBundle or require some additional configuration made by you. When you need to perform a particular check repeatedly, writing @Acl over and over again becomes a tedious task. This becomes even a more serious issue when your requirements change and you have to change a lot of ACLs. Luckily, you can configure an ACL globally in your bundle configuration and refer to using the ACL id using the @AclAncestor annotation. You can read detailed explanations for all available YAML configuration options in the reference section. When the @Acl annotation is used without a param converter, the user’s permission is checked on the class level. This means that the user is granted access as long as their access level is not NONE. When using the @ParamConverter annotation from the SensioFrameworkExtraBundle together with the @Acl annotation, the routing parameters are first converted into the corresponding Doctrine entity object. Then, access will be checked based on the queried object. It is also possible to protect Doctrine queries. Records that are part of a data grid are automatically protected by the OroSecurityBundle. View permissions are attached to each record of the data grid. In this example, first, a query is built that selects all products from the database which are more expensive than 19.99 order by their price. Then, the query builder is passed to the apply() method of the oro_security.acl_helper service. This service, an instance of the AclHelper class, modifies the query only to the return entities the user has access to. The user Mike cannot login into the Main Organization. The user Mark cannot login into the Main Organization. When the ownership type is “Business Unit”, access cannot be granted on the user level. The minimum acccess level is the Business Unit level. 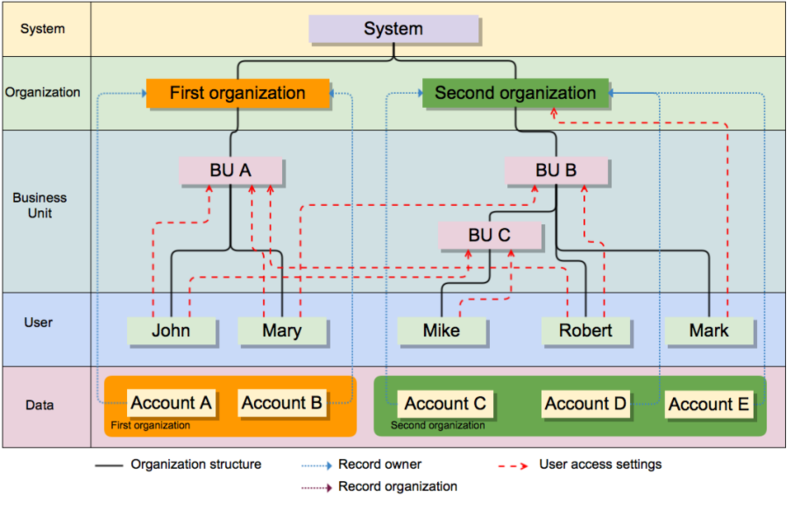 When the ownership type is “Organization”, access cannot be granted on the user level, the business level or the division level. The minimum acccess level is the Organization level. The users cannot login into the Main Organization.